OHIO VALLEY GENERAL HOSPITAL OB/GYN SURGERY CENTER — Burchick Construction Company Inc.
Ohio Valley General Hospital initiated a $30 million-dollar master plan to expand their existing hospital and upgrade their facilities to incorporate modern technology and equipment. The initial step in this plan was the addition of a 50,000-square foot Surgery and OB/GYN Center. To supplement the addition, renovations in the existing Energy Plant were included to replace chillers, add a new cooling tower, and integrate new DDC controls for the maintenance staff. The Architect was challenged to replace and expand the Surgery, OB, and Central Sterile Departments with a new addition, but without disrupting existing traffic flow and emergency department access. 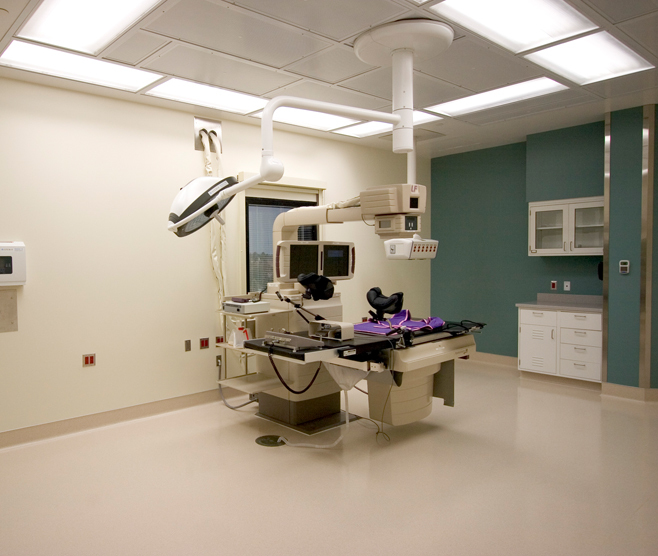 The solution was to span across the existing drive and mobile MRI dock with the Surgery and OB Levels supported at the end by Central Sterile and an on-grade Mechanical Room. An additional obstacle, which had to be closely coordinated with the Owner, was construction over the existing Emergency Room Access Road and an MRI trailer. Plans were implemented to relocate the trailer on weekends and stage traffic control personnel to re-route the emergency vehicles through new patterns while work was being completed. While working in the Emergency Access Road, flagmen were positioned to control the traffic flow, lift locations, and heights. This project included an early release of the structural framing, as the lead time for steel in 2005 was anticipated to be critical. This early release required close coordination with the remaining design of the building which was ongoing at the time.